Nothing like the winter blues to freeze one’s desires in following through with those new year’s resolutions. Good thing my life plans aren’t based on arbitrary dates. I am determined to spend more time outside because I enjoy the fresh air, the physicality, the solitude, the openness, and the discipline offered me with each step I take into the wilderness. Regardless of whether today was the last day of the first month of this new year or the first day of the last month of last year, I would still be spending my day on the trail. Since I “climbed” Mt. Teneriffe last Sunday, I thought it better take on a little less elevation today. 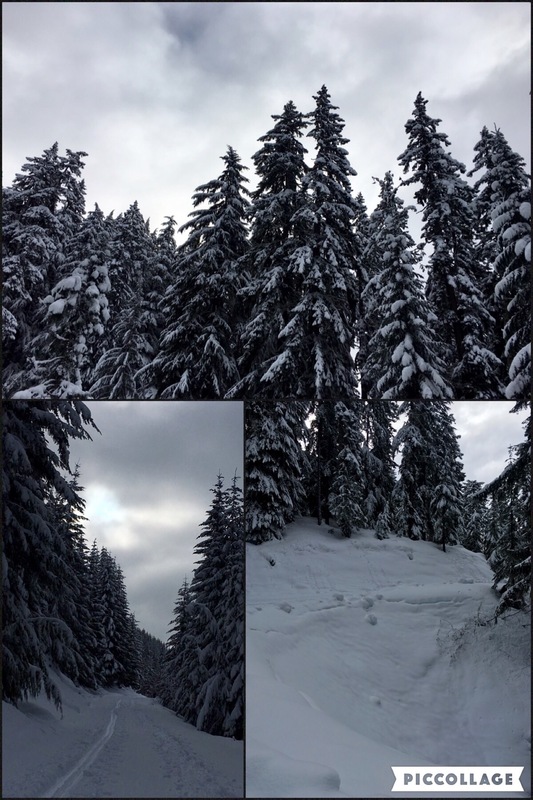 A snowshoe trek up Amabilis Mountain was just the thing to keep my winter doldrums at bay. 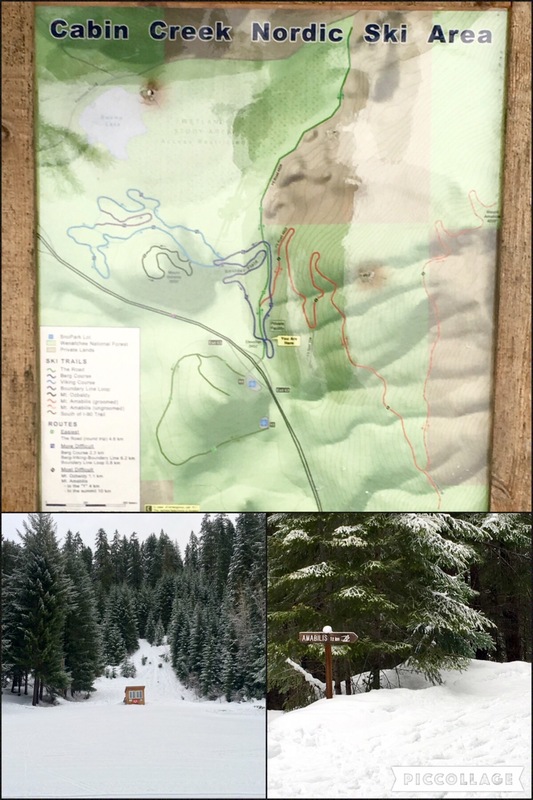 Located on the eastern end of Snoqualmie Pass, the trailhead can be found on the northern side of I90, following a walk across the highway ramp from Cabin Creek Sno-Park. When I arrived at 8:30 am this morning to the popular trail system, I was the sole snowshoer in a sea of nordic skiers heading out to explore the groomed courses that loop throughout the mountain base. With a forecast for dry skies and low/moderate avalanche risk, the lot was already half-full at this early hour. I’m glad I dragged myself out of my cozy bed when I did! 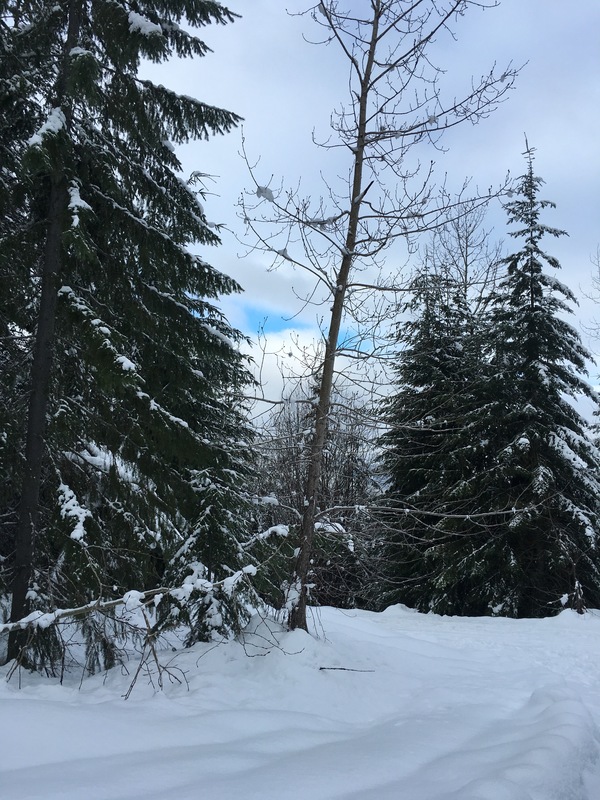 After making my way across the ramp, I donned my snowshoes and traipsed along the leftside of the groomed trails – lest I be chastised for poor etiquette. I reached the junction to Forest Road 4822 within a quarter-mile from my start and immediately headed up the mountainside away from the nordic ski trails. As I traversed past three switchbacks, I was gradually led up 500 ft. along the ridge line and granted sparse views of Keechelus Lake’s eastern shores. Light grey clouds continued to occupy the horizon throughout my morning ascent, although there were moments when hints of cerulean dared to break past the dingy cover. In any event, my snowshoe journey was a shadowy play on dark and light that danced throughout my time on the trail. Following an easy climb past the initial switchbacks, I gained an additional 800 ft. in elevation on this long road before it eventually took another turn towards the summit. The trail here felt endless, leaving me dragging slowly up the the unvaried terrain, stopping numerous times for a perspective change. I was passed by a few skiers and a set of tandem snowshoers who seemed to be undeterred by the ceaseless blanket of white draped across nature’s stage. Every so often, there would be hare and rodent tracks in the snow escaping from the trail, surprise smatterings of green lichen casually draped over otherwise nondescript trunks, as well as sap-coated icicles dangling from broken nubs that once held outstretched limbs. It was during these moments of simple beauty that my desire to continue the trek was replenished. When I finally made it to the last corner, I found myself over 3800 ft. above sea level. Yet, I was still nowhere near the summit. At least that’s what I felt as I stepped deep into the unforgiving loose powder. The trail here was literally frozen in time, with crystals seemingly formed from an era long past the present winter. The snow-crusted conifers sadly drooped from the enormous burden of the season, while bare-branched deciduous trees were meticulously painted white with single strokes of icy flakes. The surrounding landscape blended seamlessly with the overcast skies, presenting me with a monochromatic view of the world at this point. Truth be told, it was a mental war against my ego to continue forward. My ego won out. I admit pride can sometimes be my worst enemy, but today it was my best friend. Within minutes of my decision to keep going, I was rewarded with a stunning view of the western tail of Lake Kachess as it wound its way through the snow-capped mountain pass, highlighted by the peaks of Three Queens and Chikamin. After lingering a bit too long here, I checked my map to see how much farther to the summit before I would join those ahead of me. I trekked on knowing I was just short 250 ft. of elevation gain to the high point of my journey. As the last of the pack from this morning’s excursion, I unceremoniously joined the comfortably resting travelers already enjoying the open view of Lake Kachess and its splendid ridge. A kind gentlemen – a lifetime nordic skier and outdoor enthusiast – allowed me to share his view. Once I set up my makeshift seat in the snow, we ended up trading anecdotes about hiking with kids and body-boarding in Hawaii, as well as gleefully exchanging snacks like children with their school lunches. My bias was wrong: not all skiers are disagreeable towards snowshoers! Although my mocha latte warmed my soul just a tad, the brisk chill in the air slowly set into my fingers. With everyone else beginning to pack up, it was time for me to go as well. I really didn’t want to be the last one down today, for whatever prideful (or fearful) reason, so I left before the pair of snowshoers were done with their break. Since pride propelled me forward, it seemed fitting to carry me home as well. As such, my downhill return was a nonstop venture, crossing paths only with afternoon trekkers and skiers heading up the mountain. 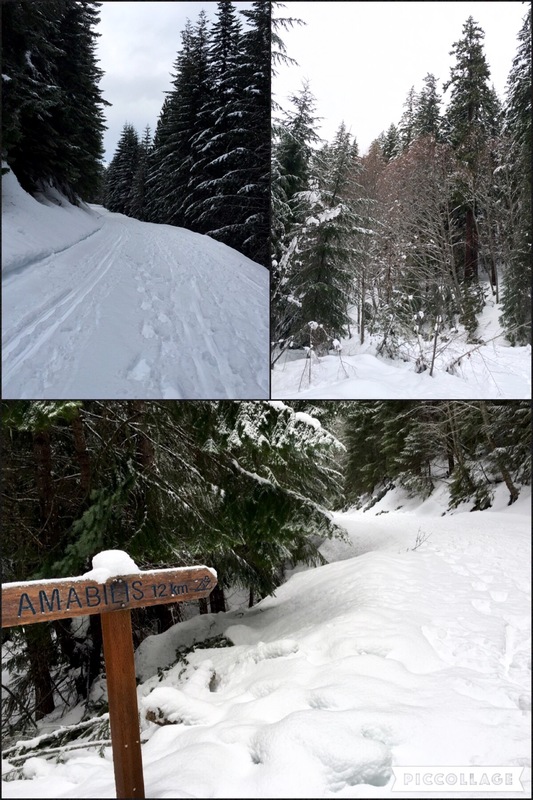 This morning’s snowshoe up the road felt like a dreadful trudge mainly due to my narrow mindset, but I was determined to make the most of my solo day out during my way down. It helped that the sun finally began to burn through the clouds, creating a uniquely interesting panorama during my return. The momentary streaks of light illuminated hazy shadows in the sky, while discretely outlining the sparse trees along the snowbanks. With my mind focused on the changes in the outbound scenery, I made my way to the bottom of the mountain before I even realized it. I’m sure that while I ended up enjoying my day at Amabilis Mountain after a slow start, I probably would have loved the journey far more under bluebird skies. Mind over matter – it’s all in my head, and my head definitely thinks I should make a return visit on a brighter day.